Heraldry (No Longer) for Sale! Well, this should be the last post of the year, and year’s end is always a time for reflection. It was almost a full year ago that I first began this little blog about heraldry. The very first entry was posted on January 19, 2009, and we all have come a long way since then. I’m happy to say that I’ve been able to keep to my commitment to post at least twice a week, and have been able to exceed it some weeks. 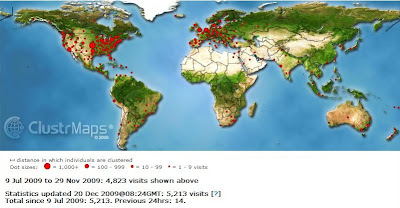 I’ve been surprised at the wide geographic spread of those of you who drop by the blog. As you can see from the ClusterMap of where visitors to the blog come from, the readership comes from literally around the world. 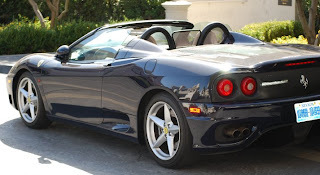 (None of the tools I have available to keep track of traffic to the blog gives me any information about any of my readers more specific than the internet service provider being used and city, region or country.) I have to admit, the visitor from Fiji was a bit of a surprise, until I found out (on Facebook, if I remember correctly) that a regular reader had been vacationing there. We’ve gone from a beginning readership of 18 visits (not necessarily visitors; someone coming back would have appeared as a separate visit) last January to our current volume of over 600 visits a month. I don’t think that this number will cause any of the large blogs to worry that I’m about to knock them out of their ranking, but it’s very impressive to me, and certainly beyond my expectations when I began. The latest traffic data I have to look at for the blog has visitors staying from well under a minute (just checking to see if there’s anything new, I assume) to over an hour (someone was apparently catching up from the earliest posts). The average visit length as of the time I write this is just a little over three minutes. We’ve recently added two more “Followers” of the blog, bringing our total to fourteen, only two or three of which are members of my family. ;-^) These are folks who have signed up to receive automatic notifications when something new has been posted. In the face of all this growth from just a year ago, I would like to take this opportunity to thank each of you for dropping by, for reading what I have to say, for leaving the occasional comment or for emailing me about a post. I hope that you have found, if not every single one, at least some of the posts to be educational, entertaining, and/or thought-provoking. For the future, I will continue to try to meet my self-imposed goal of posting at least twice a week, try to keep the posts interesting and educational, and will continue to add useful and interesting websites to the lists of links down the sidebar in the hope that this blog will become a resource for you. Thank you for helping make this year just past and wonderful one for me, and I look forward to your dropping by the blog in the coming year. She writes, "St Nicholas Center, a non-profit with US tax-exempt status, exists solely to spread the word about St Nicholas and to help people understand who Santa Claus/Father Christmas really is. We provide information about the saint, customs from around the world, and a large variety of resources for churches, schools, and families to use to celebrate his feast day. There is also a section for children with on-line activities." 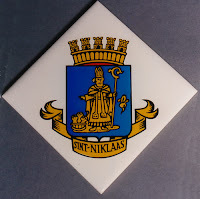 The entire site is very interesting, with a lot of information about St. Nicholas, and well worth the visit. Christmas is nearly here, with all of the joy (and the stress) that can come with it. But it’s also a good time to be pondering about the things that we are grateful for. In my case, right now, I’m grateful for the many friends and acquaintances I have made in the heraldry societies to which I belong. And one of the reasons that I belong to these heraldry societies is because of the many coats of arms that these friends and acquaintances share with others in these societies (and, by extension, me). Some of which I find interesting or unusual enough to then share with you. 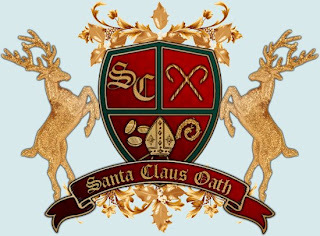 The first is from a website entitled “Santa Claus Oath” (http://santaclausoath.webs.com/coatofarms.htm), a website dedicated to a couple of extraordinary Santas. The website notes that they were creating an “historically accurate” coat of arms for the Oath, though I not sure what they mean by “historically accurate”, because, frankly, I haven't seen any historical coats that look like this. What they did try to do was to include in the achievement charges and elements meaningful to them, and these are described in greater detail on the web page given above. 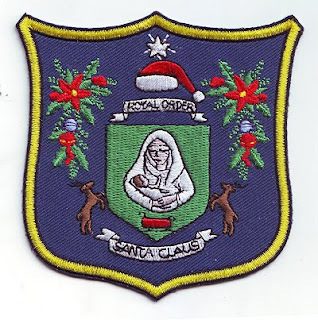 The second coat of arms comes from The Royal Order of Santa Claus (http://www.santaclausregistry.com/aboutus.html), which appears to be a part of The National Santa Claus Registry. 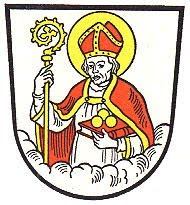 The coat of arms is pretty much self-explanatory, with both secular and religious elements portrayed. I find the use of a “Santa” cap used as a “cap of maintenance” might be to be rather appealing. In any event, I wish you all a very Merry Christmas, and hope for you to have the very best of holidays. And may your lives be filled with heraldry! 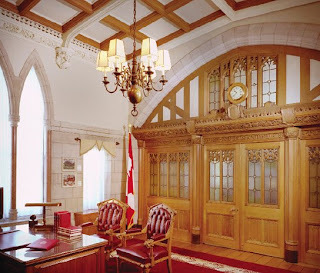 the site's got individual pages on the history, and arms and crests, of the first twelve Governors General of Canada which appear around the Chambers, as well as the three Royal cyphers there. 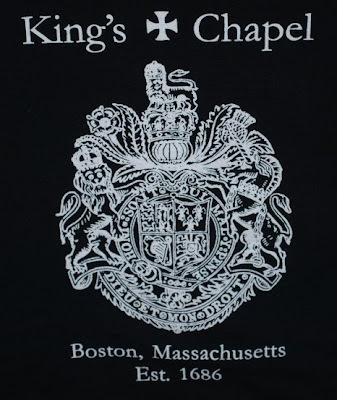 It's a really well-done site about a little known place with some great heraldic adornment that most of us would otherwise never see. Here’s a couple of humorous heraldic tee shirts that I purchased in far western Canada and far eastern Canada during a couple of trips there. 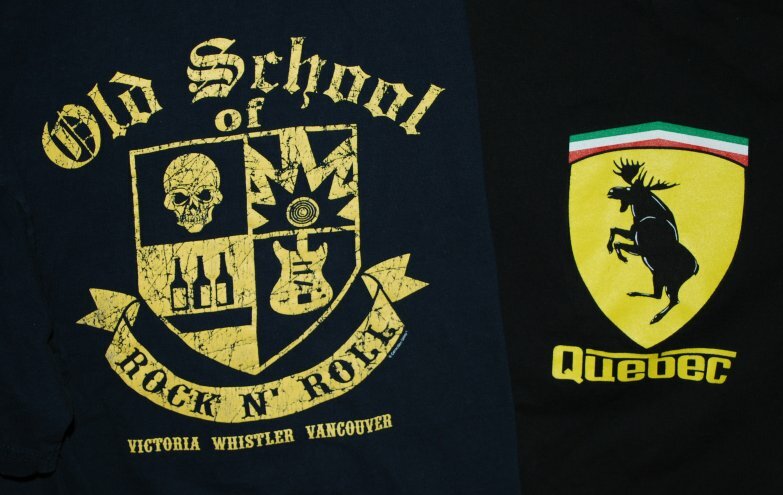 The one on the left, which I found in Victoria on Vancouver Island, is pretty much self-explanatory. It’s also a very comfortable shirt to wear. It seems to be softer than most of my other tee shirts, so I really enjoy wearing this one. And, sometimes, springing it on my heraldry enthusiast friends! 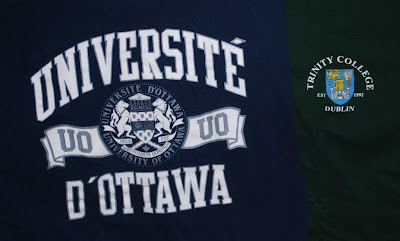 The one on the right, which, as it notes, I purchased in Quebec, is a take-off on the Ferrari logo, keeping the colors of the shield and the Italian tricolor above the shield, but substituting a moose for the rampant (or forceny) horse, and the word “Quebec” for “Ferrari”, though retaining the typeface. It was one of those that, when I saw it, I just knew that I had to buy it! It was simply too funny to pass up. 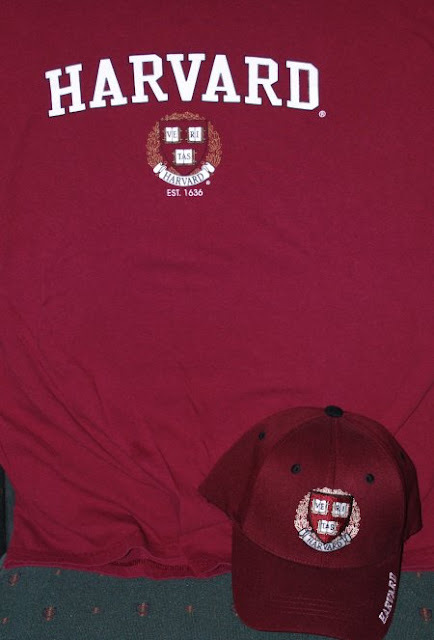 Last post I noted the gimme cap that I bought in Cambridge with the arms of Harvard University on it. Today, I’m showing of three more caps, two with coats of arms and one with a town seal that is only semi-heraldic. On the left, we have a cap I bought in Quebec in 2008 during the International Congress of Genealogical and Heraldic Sciences held there. The cap was bought at the gift shop in the Citadel, the large star fort that once was the main defense for the city, and is currently the home of the Canadian 22nd Regiment. The coat of arms on the Regimental badge is, appropriately enough, the arms of the Province of Quebec. On the right is the cap I picked up at the Edinburgh Tattoo in 2006, which we attended while at the Congress held in St. Andrews, Scotland. The Tattoo has its own coat of arms, with the white saltire of Scotland and the castle of Edinburgh splitting the chief between them. Finally, though less truly heraldic, is the seal of the town of Upton, Massachusetts, which some of my ancestors lived in (including my third great-grandfather and his first family, about whom none of his later family seems to have known. His first wife and their infant son both died early and are buried in one of the older cemeteries in the town. And, yes, for the genealogists among you who are asking, while we were there I got pictures of their tombstones). 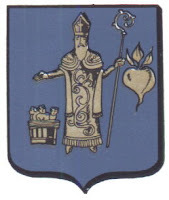 The seal contains a sheaf of wheat (heraldic “garb”), indicating the primarily agricultural base of the town. This time from another educational institution, Harvard University. But you know I just had to check out the gift shops around the university to see if I could find a tee shirt with the well-known Harvard coat of arms. In doing so, I managed to find not only a tee shirt, but a gimme cap, as well, as you can see here. There’s actually a fair bit of heraldry in and around the university, on the buildings, on signs, in windows. It was really nice to see not only the appropriate use of heraldry someplace here in the U.S., but also the number of different coats of arms so used. If you ever get a chance to go to Cambridge, I recommend taking the time to walk about the campus (and especially the walled Harvard Yard) to see the heraldry there. 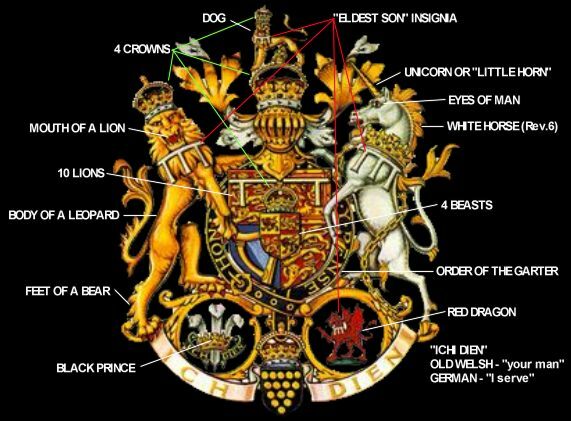 Based on an interpretation of his achievement of arms, is Prince Charles the Anti-Christ? There’s a website out there that would have you believe so. The website Mouth of the Lion by Jason Guenther http://www.thelowestroom.com/Jason/MouthOfTheLion/lionsmouth.htm discusses, among a lot of other things, the depiction of the achievement of arms of Charles, Prince of Wales and Heir Apparent to the throne of the United Kingdom, and how that achievement can be used to demonstrate, well, just all sorts of bad stuff. Anyway, I thought it was an interesting misapplication, or misinterpretation, or at least misunderstanding, of heraldry today. Fellow American Heraldry Society member Rev. 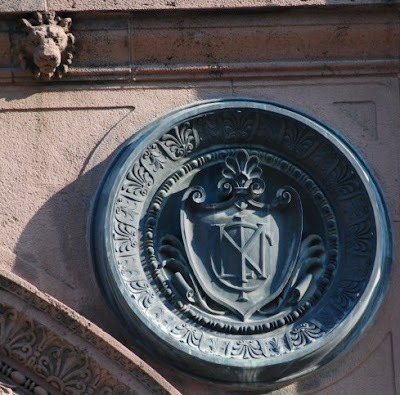 Guy Sylvester has put up a couple of images of heraldry related to Thanksgiving on his blog, Shouts in the Piazza, at http://shoutsinthepiazza.blogspot.com/2009/11/thanksgiving-heraldry.html He's got the early seal of Plymouth Colony there, and a rendition of the arms of Franklin Delano Roosevelt, who set the fixed date for Thanksgiving as national holiday. In keeping with the theme, I thought I'd add a couple more coats relating to, if not theThanksgivinging holiday proper, at least with those hardy souls who survived the first winter in what has since become the Commonwealth of Massachusetts and celebrated a Thanksgiving feast sometime in the fall of 1621. First is the arms of the city from which they sailed on the Mayflower and the Speedwell (alas, poor Speedwell. Its name did not match its abilities), and for which they named their new colony in America: Plymouth, England. 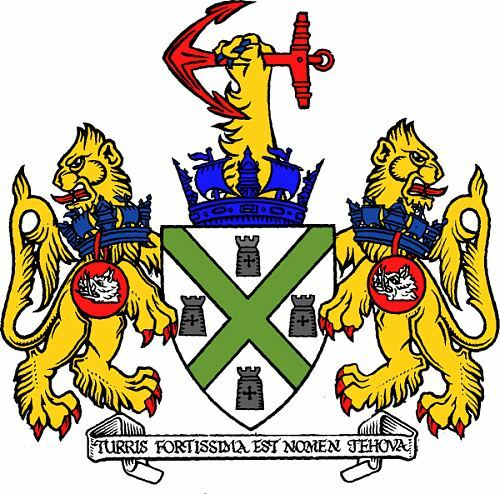 Coincidentally, the arms of the city of Plymouth were recorded in 1620, the year the Mayflower sailed from there. The lion supporters, though not officially granted until 1931 (as was the crest), were sometimes used earlier. The other coat of arms is that of the city in which a number of the Separatists (those whom we now usually refer to as "Pilgrims") lived after leaving England but before making the decision to cross the Atlantic and begin a new colony in what was to have been northern Virginia (actually someplace near to what is now New York City). So they left Leiden aboard the Speedwell, met up with others and the Mayflower in England, thus making, for many of them, Leiden as their first port of emigration. Well, it looks a little like heraldry, anyway. 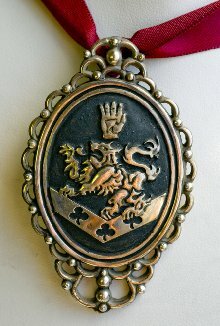 The Twilight phenomenon, recently accelerated with the release of the second Twilight movie, New Moon, has also stirred interest in some of the lesser-known aspects of the stories, including the Cullen family “crest” (for an example of which, see the image below. A ring gives the same arms, but with a red background), and a jewelry designer in Portland which creates pieces for the two, soon to be three, movies. If anything there interests you, you can order it directly by clicking on the appropriate Buy Now buttons and pay through PayPal, or print out an order form and go "old school" by ordering through the mail. We do ship internationally -- postage is a bit higher for shipping outside the U.S., but that's something that's not within my control. I was sitting down after a long hard day of talking to people about heraldry (well, okay, for those of you who know me well, it _wasn’t_ hard. I drove to Tyler, Texas and gave a presentation on heraldry and some Mayflower passengers who are believed to had the right to or used coats of arms. But I digress) and was kicking back and relaxing watching one of my favorite shows, the Discovery channel’s Mythbusters. Why is that show one of my favorites? Well, anytime you can mix myths (some urban, some not), science, and explosives, you just know it’s gotta be a good show. Anyway, in this one segment they were attempting to recreate a 19th Century naval battle off the coast of South America, where one of the two ships ran out of cannon balls and substituted balls of cheese to shred the other ship’s sails (effectively immobilizing it). 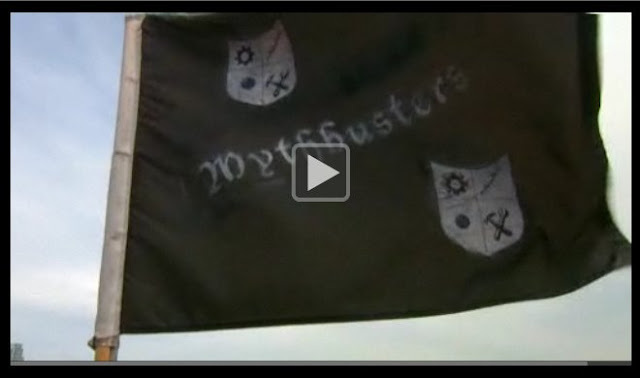 At one point during the set up for this attempt, they showed, _very_ briefly, a flag that had the word “Mythbusters” on it between two “coats of arms”. Now, I’ve said this before, and I’ll say it again: sometimes, I really _love_ some of the things you can do with modern technology. Because I was able to go out on-line and find a clip of that episode, play it, pause it at the right place, and do a screen shot of that flag. And here it is. For a blazon, the best I can do is: Quarterly, first, Argent, a cogwheel sable; second, Argent, the word “Mythbusters”[?] in bend sinister sable; third, Argent, a roundel [perhaps symbolizing the globe?] sable; and fourth, Argent, a crescent wrench bendwise sinister per bend sinister argent and sable, the argent portion fimbriated sable, and in bend a claw hammer sable. So, it’s not “real” heraldry. And it’s not even particularly good faux heraldry. And yet, it’s another demonstration of the fact that coats of arms have become an integral part of our culture and are still finding uses even here in the 21st Century. And I find that fact to be very cool! Oh, and idea of using cheese as a substitute for cannonballs? If it’s a hard enough cheese that isn’t “brittle”, that is, it retains a fair bit of elasticity, yup, it’ll go right through a canvas sail when shot from a cannon. No, no, not the “first three coats of arms in the world” that you can sometimes find in Renaissance, especially in Renaissance German, armorials (for example, Virgil Solis’ Wappenbüchlein, published in 1555). 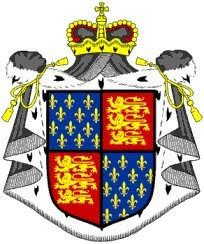 No, I’m talking about what is generally accepted to be the very firest coat of arms, used in an hereditary way*, borne first by Geoffrey le Bel, Count of Anjou (1113-1151), and later by his grandson, William Longspee, Earl of Salisbury (ca. 1176-1226), here as shown on their tombs. 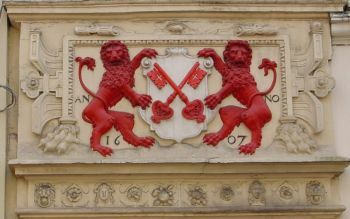 But it means that not only do I happen to enjoy activity in what I (in my own quiet, understated and pseudo-humble way) consider to be one of the greatest hobbies in the world (heraldry), but that I have a family connection to the very earliest days of the use of heraldry. And I’d thought that no one in the family had ever used a coat of arms. That’ll teach me to make assumptions like that. 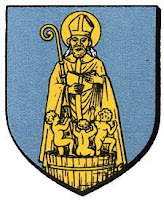 It turns out that someone in the family, my 25th great grandfather, used the very first coat of arms! As I noted in my last post, by golly, there appear to have been others in the family who used coats of arms. 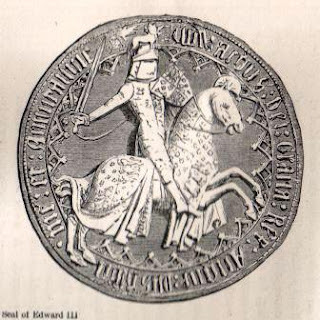 But in addition to that, my descent goes from Edward III through his son John of Gaunt, Duke of Lancaster, and John’s mistress and third wife, Katherine Roet (it was her second marriage), whose father was Sir Paon (or sometimes, Paonet) Roet (or Ruet), Guienne King of Arms. It’s very difficult to find out very much “hard” information about Sir Paon; it’s a lot easier to find out information about his daughters: Katherine who was mistress and later wife to John of Gaunt; and Philippa, who married Geoffrey Chaucer. But most references to him note that he was Guienne/Guyenne King of Arms, which means that, by golly!, I’m not the first herald in the family. 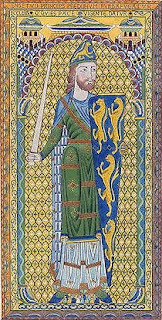 So apparently, I come by my interest in heraldry honestly - I inherited it from my 19th great-grandfather, Sir Paon Roet. There's a website that has a new way of looking at national flags. The "Flags by Colours" page at http://shaheeilyas.com/flags/ drafts out the different national flags as piecharts, each one with the colors proportional to the area of the color on the respective flag. It's really kind of a cool page to check out. It's interesting to see the various proportions of colors in different flags. And clicking on the pie chart will reveal the flag, in case you are going, as I found myself doing more than once, "What the ...?" 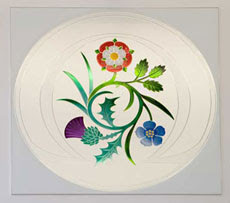 An article from the BBC News from November 4, 2009 is about a piece of heraldic stained glass work that has come to light in Edinburgh during the refurbishment of the Fraser Suites Hotel. The arms are those of the University of Edinburgh, though the motto is apparently that of Sir Patrick Geddes, known for his work in urban planning along the Royal Mile in Edinburgh. I must say, the window is a beautiful piece of work. And this one has the audacity to use a standard heater shield. Why? According to the website of the University of North Carolina School of the Arts, “The shield design is reminiscent of the tradition of many universities with rich and distinguished histories.” Gosh, if they wanted something in “the tradition of many universities with rich and distinguished histories,” why didn’t they just obtain a coat of arms, like those other universities do? And how did they come up with this particular design? They hired a “branding firm” to create a new “logo family” for the school. The new “logo family” is the result of “six months of exploration, development, and refinement.” Alas, they don’t say how much they paid for that six months worth of “exploration, development, and refinement,” but I bet it was plenty. Sometimes I think I must be in the wrong business. Heck, I can develop logos with equal amounts of “meaning” and cool graphics, and probably crank ‘em out in a lot less than six months and at much less expense. Oh, yeah, those “logos” are really designs for coats of arms. Foolish me. Maybe I should call them “logos” and take up to six months to create them and charge a whole lot more than I currently do for research and/or design. Then I, too, could be a “branding firm” instead of just an “academic herald.” Hmm. Let me think about that. No. The headline read "Mysterious Private Security Firm Gets Control Of Empty Jail In Small Montana Town". What does all this have to do with the use, or misuse, of heraldry in the USofA? 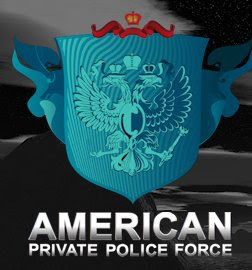 Well, just take a look at the APF’s coat of arms, from one of its vehicles. 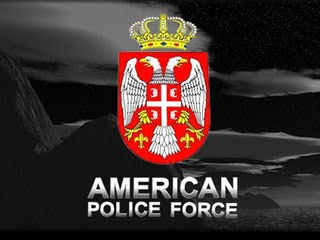 Anyone here recognize the coat of arms of Serbia? Right down to the gold fleurs-de-lis by the eagle's talons? Yes, I thought you might. 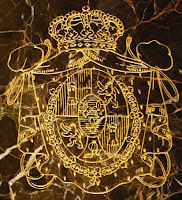 (For those that don’t, see them on the Heraldry of the World website at: http://www.ngw.nl/int/yug/yu-nat.htm) Why use the arms of a sovereign nation for its logo? I have no idea. It seems like a remarkably poor idea to me, but then, how many people can recognize the arms and identify the nation to which they belong? In this country, alas, not that many. But many heraldry enthusiasts decry the substitution of modern logos in the place of coats of arms. There is an article in Ireland’s Genealogical Gazette from February 2009 at http://www.docstoc.com/docs/4324120/Irelands-Genealogical-Gazette-(February-2009) discussing the new Supreme Court emblem and comparing it to the logo of the Irish Courts Service, and then lamenting, as I have done before in this blog (click the keyword "logos" near the bottom of the left-hand column for prior posts here on this topic), the adoption of commercial logos over the use of already-existing coats of arms and/or heraldic badges. In this particular instance, while I applaud the incorporation of symbols to represent the often-overlooked (at least symbolically) stepchildren of the UK, Wales and Northern Ireland, it seems a shame to me that they felt that the Royal Arms, which have served so well as a symbol in so many other courts in the UK, could not be used here, and that they instead chose this somewhat abstract logo which by itself says nothing of the organization by which it will be used. Okay, I’ll admit it. I’ve found heraldry in some odd places, places I never really expected to find a coat of arms, and yet, there they were. But these coats of arms pretty much take the cake for the "odd or unexpected place" category. We were finishing up dinner at the buffet in the Bellagio hotel on the Las Vegas Strip, and I needed to use the restroom. So off I went, a man on a mission. And immediately after went back to our table, asked my wife to borrow her camera (because I wasn’t going to be taking any pictures, and had left mine back at our hotel), and headed right back to the restoom. Because, by golly, right there in the men’s room was heraldry! 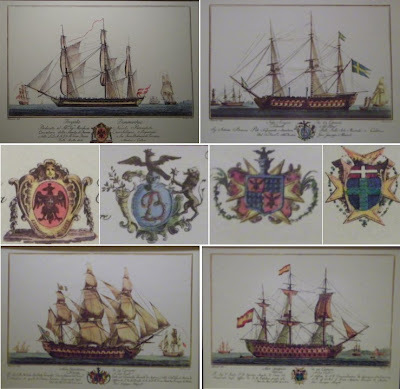 Just inside the entrance were four framed prints of sailing ships, each with a coat of arms (well, one of them might not really be considered to be armory, but still, it’s on an escutcheon). So I tried not to block the traffic in and out too much as I took photographs of the prints and then closeups of the shields on each of them. And here’s the combined results. Heraldry. It’s insidious. It can be found anywhere. And everywhere. Including, as I found out, in the men’s room at the buffet in the Bellagio Hotel in Las Vegas, Nevada. We continued to find serendipitous heraldry later that weekend, as the seven of us went out to eat at the buffet at the Bellagio (just across Flamingo Road from Caesar’s Palace). I’d seen some pretty good reviews of the buffet at the Bellagio - all of which it more than lived up to - and so we all met there and sat down to a really great feast. The room was decorated with various framed prints. And I’m sitting there at the table and looking around occasionally (when I wasn’t either shoveling food in or talking with one relative or another), and by golly! There on the wall was, I thought sure, some more heraldry. So I borrowed my wife’s camera (silly me! I’d left mine at the hotel. I wasn’t going to be taking any pictures at dinner. Right? 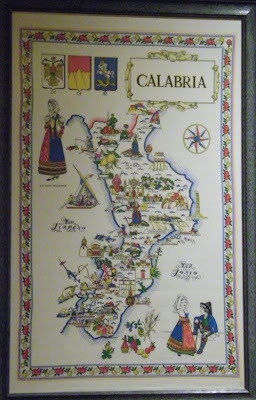 ), and walked over, and sure enough, there was a framed print of the Calabria area of Italy, with not one, but three, coats of arms in the upper left-hand corner. I guess I’m just going to have to start carrying my camera around with me all the time, because apparently you just never know when you might run across another coat of arms! "The Office of the Chief Herald is currently not accepting new applications for grants or confirmations or arms owing to the retirement of the Chief Herald. The application process will resume when a new appointment has been made." So says an announcement on the website of the National Library of Ireland (of which the Office of the Chief Herald is a part). 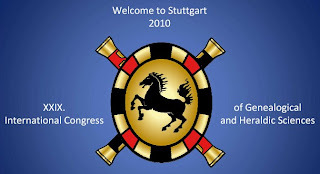 The XXIX International Congress of Genealogical and Heraldic Sciences will be held in Stuttgart, Germany, September 12-17, 2010. The theme for next year's Congress is "Identity in Genealogy and Heraldry". The official website for the XXIX Congress is now up and running. You can find it on the web at: http://www.congress2010.info/ Information on the Congress is available there in German, English, and French; just click on the appropriate flag on the right (Germany, United Kingdom, France). I guess that now that the website is up, I'll have to start getting serious about making my plans to attend. 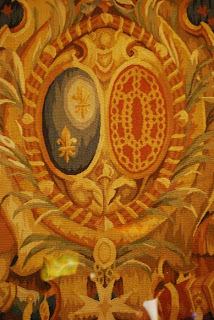 Continuing on our odyssey around Caesar’s Palace in Las Vegas, we found ... more heraldry! This in addition to all of the statues, etc. placed around the pool and various fountains inside and outside of what have become heraldic charges: dolphins and seahorses, winged lions and winged sea-lions and Grecian sphinxes. Now, that would be a fun piece of heraldry to own! Still, we did manage to get out to the Strip to visit a couple of the major hotels out there. Which visit proved to me once again that you can find heraldry anywhere and everywhere. 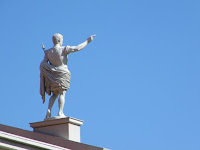 For example, we were wandering around in Caesar’s Palace, just looking to see what we could see. We’d gone there because Jo Ann wanted to see some of the statuary that they’ve put up, and there was plenty of that. But as we wandered down this hall and up that way, we ran across the Cartier jewelry store. That by itself wasn’t particularly noteworthy (especially since they weren’t open yet), but on either side of their entrance was a coat of arms: to the left, Portugal; and to the right, Spain. Both done in gold on black veined marble, and even hatched (partially, anyway). Then, down another hall around the corner, a very nice window display with a tapestry containing ... you guessed it! More heraldry. This time, the arms of France (well, sort of, with only two fleurs-de-lys instead of the expected three) and Navarre. Not at all the sort of thing I expected to find early on a weekend morning in a hotel/casino on the Las Vegas Strip. Heraldry, it’s everywhere! 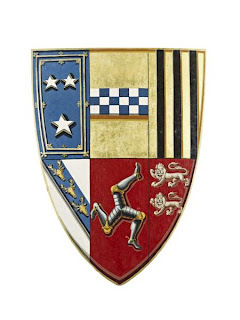 It may be that, between Doonesbury making fun of the arms (below) and the troubles The Donald has had getting his big golf resort going in Scotland (with it’s own "coat of arms" – which the Court of the Lord Lyon King of Arms informed him he could not just use in Scotland! ), it was decided that the TU coat of arms was just a little bit too pretentious. Or too big of a target. In any case, all that appears as a logo now is a gold rampant lion. 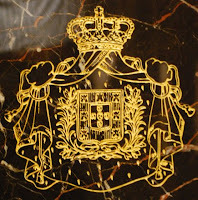 Adieu, fake coat of arms, adieu. Mayhaps you have gone on to a better place. Not that I’m certain that an heraldic lion, even without the shield, is all that much of an improvement over the faux coat of arms. But what do I know? ... in Las Vegas? Out in the desert of southern Nevada? Really? Well, yes, but they actually copied it from Italy, so it’s not like it’s native heraldry. Outside of Caesar’s Palace on the Las Vegas Strip (which consists of Las Vegas Boulevard South going south from where Sahara Avenue crosses it out past the city limits) they have, among other things, a working scaled-down (but still large) replica of the Trevi Fountain in Rome, Italy. Near that replica is another fountain, pictured here, also copied from the real one in Rome, with those really great dolphins (urinant, if we’re going to use the heraldic term for their posture) holding up that big escallop shell with their tails, atop which (the shell) is a triton pouring water out of a whelk shell. It’s a very exuberant composition all in all. Nestled into the space between two of the dolphins’ bodies is an achievement of arms. Specifically, it’s the arms of Pope Urban VIII (born Maffeo Barberini), whose arms were Azure three bees or. Here, the arms are carved with the crossed keys of St. Peter issuing from behind the shield, each key encircled by a dolphin’s tail, and the shield itself surmounted by the papal tiara. You can see them better in the detail of the fountain here. Who’d have thought that you would, or could, find a papal achievement of arms in the middle of the American southwest? I swear, I think it becomes truer every time I say it: "Heraldry is everywhere!" 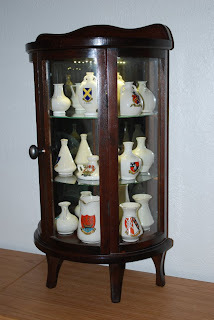 I wrote some time back (on May 28, 2009) about having finished up a restoration project on a small half-circle display cabinet that we’d bought as a nice place to display some of the "crested china", small fairings with coats of arms on them, that we’d managed to purchase over the years. The trouble was, having finished the restoration/fix-up, I didn’t have a good place to put it. It didn’t fit decently anywhere in the heraldic library, and so it was going to take some thought - and probably some rearranging - to find a place for it. Well, the other day we did it! It did take a little rearranging, but only a minimal amount. In the downstairs library (the heraldic library is upstairs) we have some cabinets that act as a long side table, with various prints and pictures and whatnot hanging on the wall above them. I took down one of the pictures we’d been talking about getting rid of for some time, moved the watercolor that was below it up, and Presto! Instant space for fairing cabinet. So, as you can see in the picture above, I’ve got the cabinet set up, plugged in (for the LED lights mounted underneath its top), and filled it with fairings. (There aren’t as many fairings and they aren’t as crowded as it looks like in the photo; the back wall of the cabinet is a mirror. It’s the reflections of the fairings off the mirror that make it look so full.) The flash unit of the camera tends to wash out the display lights of the cabinet, but you can still get a good idea of what it looks like from the photograph. Standing alone in the ambient light with the LED lights on, it’s pretty spectacular - in a not overpowering way - in the library. The eight Eglinton shields that were the subject of my last post have now been sold at auction in Edinburgh. (No, alas, not to me! I can afford the occasional moderately expensive antiquarian heraldry book, but I knew from the beginning that these shields were going to well out of my price range.) The updated on-line catalog (see the link in the previous post) notes that the eight painted wooden shields, with an estimated sales price of £3,000-£5,000, went to a high bid of £6,500 (that's US$10,385.95 at today's exchange rate). Below is the shield of Lord Glenlyon (later the 6th Duke of Atholl). For this final post on heraldry in the heartland of America, we leave Omaha, Nebraska, and go a few miles south to Topeka, Kansas. And here’s the (cropped) result. These "arms" also show up on the flag of the city (about which - that is, the flag - more information can be found on the Flags of the World website at http://www.fotw.net/flags/us-kstpk.html). It’s difficult to find more information about the arms themselves. 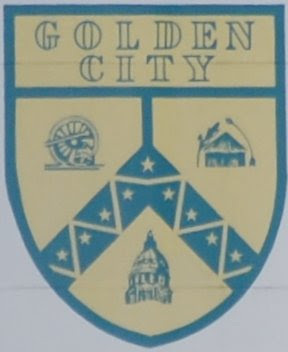 Unfortunately, despite its prominent placement on the water tower, the City of Topeka does not seem to show its coat of arms anywhere on its website, nor does it explain the meaning of the various elements on the arms. Here’s the little I have been able to glean, plus some of my own speculation about the arms. The stars on the chevron represent the city’s founding fathers (according to a website about the nuclear submarine USS Topeka). The charge in dexter chief appears to be a locomotive engine wheel, and the railroad was certainly a large factor in the development of the city. The charge in base is the capitol dome; Topeka is the capitol city of Kansas. For the rest, well, your guess is very likely as good as mine. 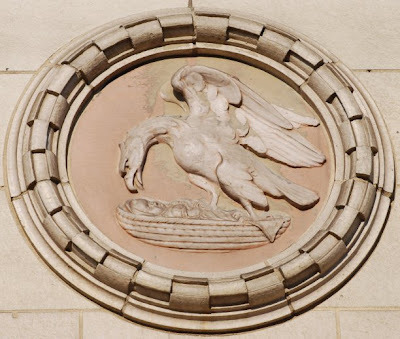 For our final "coat of arms" found in Omaha, Nebraska, we go to the arms-like logo of the Union Pacific Railroad Company, as mounted onto a marble wall outside the Union Pacific Center there. The logo of the UPRR is basically a shield of the arms of the United States (well, they do reverse the tinctures of the paly field; in the U.S. arms they are paly of thirteen argent and gules, while on the UP logo they are paly of thirteen gules and argent), with the addition of the words "UNION PACIFIC" one above the other in white letters on the blue chief. Here’s a color version, photographed from the side of a UPRR boxcar. The bottom line? It’s not "real" heraldry, but it comes close. Okay, we’ve looked at an achievement of fake arms, and at a shield that only held some monogrammatic lettering. Today we take a look at some real heraldry. On that same building was an actual, honest-to-goodness crest! No torse, but identifiable as a crest nonetheless. It took just a few minutes of research in Fairbairn’s Crests of the Families of Great Britain and Ireland to learn that it was the crest of Stanley (Northampton) which is blazoned as: An eagle, azure preying on a child proper, swaddled in a basket gules. There are several families which bear a crest of an eagle preying upon an infant, but the Northampton family of Stanley appears to be the only one where the child is not only swaddled but is laid in a basket. 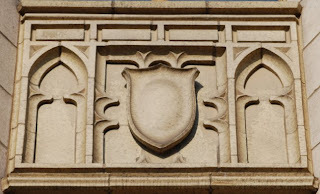 Continuing our survey of some of the heraldry and pseudo-heraldic devices to be found in downtown Omaha, Nebraska, these come from the exterior of what is now called The Omaha Building. 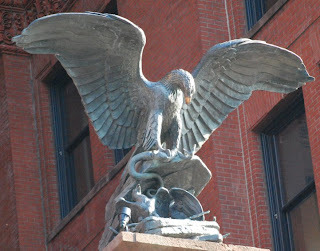 Built in 1888, probably its most noticeable feature is the statue of the eagle, snake in its claws, with its eaglets in the nest immediately below the rock on which it perches. 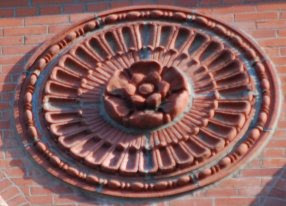 Finally, there was this really great double rose, placed directly over the main entrance to the building. (I won’t call it a Tudor rose, since it has no tinctures, and Tudor roses are always a combination in one way or another of red and white, or more specifically the red rose of Lancaster and the white rose of York.) But what a beautiful piece of carving of a classic heraldic charge.